Embossed star with a raised text, Law Enforcement Officer, entirely in pewter. The smooth, sturdy glass mug is tapered and has a starburst light-reflecting pattern on the bottom; the smooth heavy gauge lid is removable! 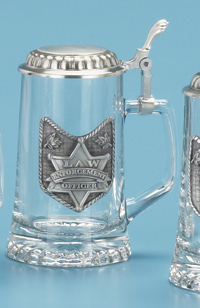 The stein has a special threaded hinge pin. The lid is easily removed and reattached by simply tightening and loosening the hinge pin with a screwdriver.